I was supposed to post this by yesterday. But today is Talk Like a Pirate Day. So I thought this review and giveaway simply HAD to go up today instead. 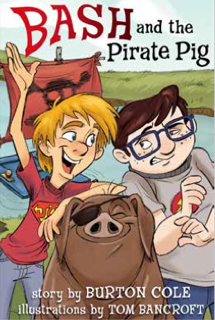 Bash and the Pirate Pig by Burton Cole isn't really about pirates, though. Instead, it is a fun read told from the point of view of a 12-year-old "city cousin" who is sent to stay at the farm for the summer, and to keep an eye on his younger cousin. Three months younger. Because when you are 12, those three months seem like a really big deal. Ray would prefer to spend his summer at home, reading comic books and playing video games. He doesn't have much of a choice though, and it is off to the farm and lots of adventure with Bash. Poor Ray really doesn't have any idea as to the scrapes he is going to get into. At this point, I've read the book myself, and I'm debating whether to read it aloud to Richard and Trina, or whether to let Richard read it himself. It would be a bit of a stretch for him, but the antics of these two boys might make him push to read it. And William (14) and Thomas (12) are definitely going to be encouraged to read it. I know they will love it. One reason I hesitate about reading it aloud is that I waffle back and forth about my 7 year old hearing all the name-calling these two cousins do. For families who are sensitive to that issue, I do want to point out that the two act a lot like, well, 12-year-old boys. That is to say, they aren't exactly respectful to each other or the other kids around. At some points in my parenting life, I've been fairly opposed to exposing my kids to that kind of talk. You know, my kids can call each other names just fine on their own, they don't need characters in books modeling it for them. Right now, at least for the older ones, that isn't a huge concern of mine. It isn't like they don't hear real-life examples all of the time, and I rather like that these two boys feel so very real and not so 'goody-goody' like the kids in some stories. Clearly, especially by the end of the story, the two like each other and stick up for each other. They are basically good kids. But real ones. And their adventures are hysterically funny. I loved watching the parents the most. The dads are brothers, and apparently they were a handful as youngsters too. I identified the most with the dads, watching the kids get into mischief and thinking back to how similar their childhood was. The moms seemed a bit high-strung and afraid of a few scrapes. It reminded me a bit of my household, actually. I grew up with two younger brothers, while my husband is an only child. It isn't so bad now, but he used to get pretty uptight when our kids acted like siblings. He couldn't really relate. I remember all too well how I would complain about my stupid brother, but five minutes later I'd be pounding a friend who criticized him. Not sure why I meandered off onto that story. Anyway, this is a fun book, and it is great to watch Ray's growth as the summer progresses. This is a kids' book, so I don't stress about spoilers in my review. If you don't want to know, skip to the giveaway part. Ray starts the summer off as a kid who is flirting with the wrong paths in life. He endures church because his parents make him go, he isn't very respectful to anyone, that kind of thing. Bash has a pretty easy-going relationship with God, and that does begin to rub off on Ray. A dying calf is a turning point for Ray, or maybe the turning point was actually when he nearly drowned on the Pirate Pig's ship. Regardless, Ray is a different child at the end of the summer, and there are some wonderful spiritual lessons that are casually woven in to the storyline. This looks like a very cute book. My boys would love to read this! I'm in complete agreement with Erika! I do remember going canoeing one time and rocking the canoe to see how far it would go before tipping!